We also custom make tables, bookcases and cabinets in solid timber- recycled or plantation, in any style. Please call 0403000799 or click here to contact Patrick. Original Birch Chest in the Biedermeier manner, Danish origin Circa 1835. Ebony escutcheons and working locks.The sharply figured flame birch has been lightly finished in clear shellac. A smartly proportioned original piece. On tapered legs with lovely rustic patina this original French piece will add earthy character to your kitchen or dining room. Seats 6 easily, 8 at a pinch. Revived original finish. 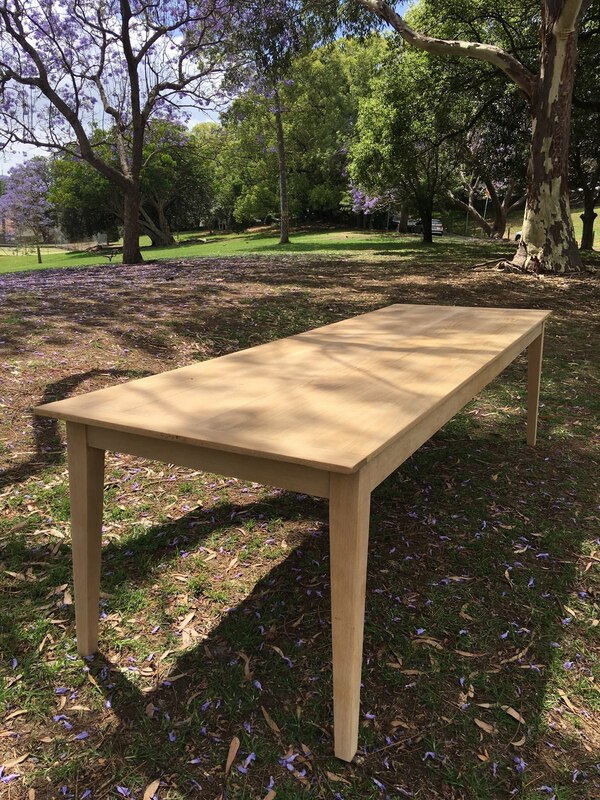 The first known example of an Australian Cedar Serving Table from the Macquarie era of Australian white history. The bow fronted top is one piece with cross banded edges over a curved apron with a simple applied moulding to the lower edge. The front legs have a distinct Regency shape with finely executed acanthus carving to the knee, and terminate in stylized Sphinx four toed feet. The rear legs echo the front leg shape without embellishments. It is an extremely rare early 19th century artifact with stylistic connections to contemporary Georgian and Regency designs of the period. The finish has been revived and the patina is exceptional and original. An excellent Australian cedar secretaire from the Regency period featuring a fall front drawer desktop with enclosed stationary drawers. The fall front and lower doors feature matching corner carved decorations in a shell based or linen fold motif, a rarity for this period in Australia. The top and base are crossbanded (in cedar) over turned feet. A fine French walnut mid 19th century French abatante or secretaire. Drop front with a fitted interior, flanked by half turned pilasters with brass capitals. A superb mid 19th century French walnut commode in lovely faded condition, the 4 drawers flanked by half turned pilasters caped with moulded brass capitals. Choice of granite or marble top. Mid 1800s Cedar side Table stamped J Hill. The reeded edge top over three drawers on a shaped stretcher base terminating in bun feet. Finish revived and repolished with 19th century patina retained. Hill was a renowned cabinet maker in Sydney during the 1850s and 60s with premises in central Sydney. As well his impressed stamp, some of his other documented pieces are labeled. An early 19th century Austrian Biedermeier table in birdseye satin birch, with a shaped top, cabriole legs with acanthus carving and scroll feet, featuring a single drawer wth an inlaid escutcheon. In good condition with a warm mellow finish.